Adopt a watermelon motif for your kitchen this year with this free crochet pattern to make a set of watermelon hot plates and napkin holder. The vivid contrast of red and green also provides a dramatic splash of summer color for dining al fresco under the stars. Notes: This is a vintage pattern from 1954 that is often for sale on etsy, ebay and other sites. The pattern on this page is from my private collection of vintage patterns. This customized HTML version is made freely available to visitors of AllFreeCrafts ONLY and cannot be reproduced on other blogs or websites or made available for free download or resale. 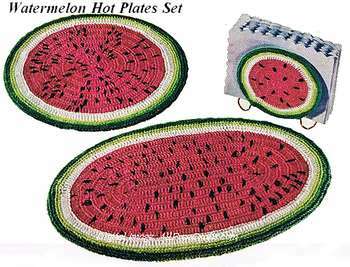 Please link to “Watermelon Hot Plates Crochet Pattern” to share this free pattern with others, or use the social media buttons at right to Like, Pin or Share. Thank you so much! Watermelon carvings are eye-catching conversation starters at any gathering. See the Watermelon Promotion Board’s collection of Watermelon Carvings for inspiration (click on the carvings you like for individual project instructions), then check out some Watermelon Carving Tips to make your own. 1 skein of No. 12 black. Wire napkin holder, 5 inches in diameter; round wire hot plate racks 9 and 11 inches in diameter; oval racks 7¼ and 12½ inches and 10 x 15-1/2 inches. LARGE ROUND MAT…Starting at center with Watermelon, ch 2. 1st rnd: 7 sc in 2nd ch from hook. Join with sl st to first sc. 2nd rnd: Ch 3, 2 dc in same place as sl st, 3 dc in each sc around. Join to top of ch-3. 3rd round: 2 sc in same place as sl st (1 sc increased), * sc in next 2 dc, 2 sc in next dc. Repeat from * around. Join. 4th rnd: Ch 3, * 2 dc in next sc (1 dc increased), dc in next sc. Repeat from * around. Join. 5th rnd: Sc in same place as sl st and in each dc around, increasing 7 sc evenly around. Join. 6th rnd: Ch 3, dc in next sc and in each sc around, increasing 14 dc evenly around. Join. 7th to 14th rnds incl: Repeat 5th and 6th rnds, being careful not to have increases directly above increases on previous rnd. Break off. 15th and 16th rnds: Attach White to same place as sl st and work as for 5th and 6th rnds. Break off.